An international collaboration led by DESY and consisting of over 120 researchers has announced the results of the first scientific experiments at Europe&apos;s new X-ray laser European XFEL. 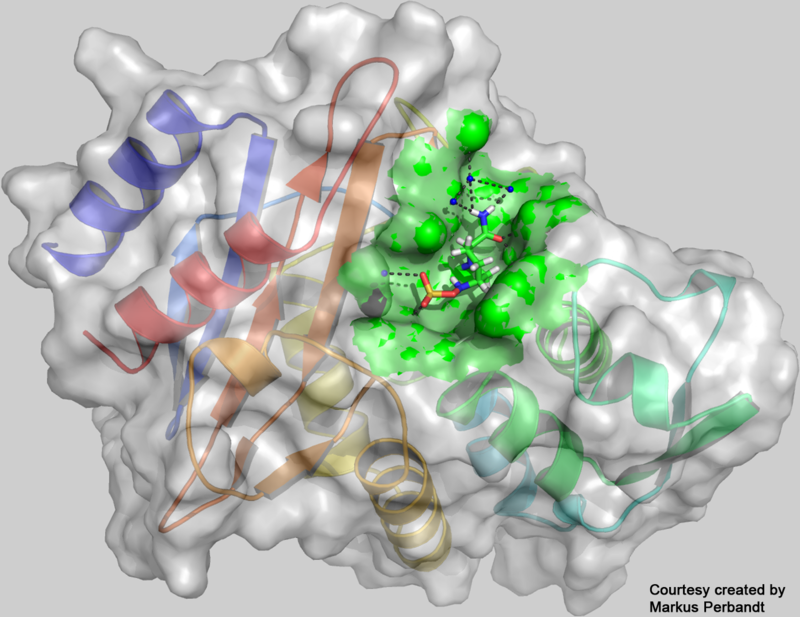 The pioneering work not only demonstrates that the new research facility can speed up experiments by more than an order of magnitude, it also reveals a previously unknown structure of an enzyme responsible for antibiotics resistance. “The groundbreaking work of the first team to use the European XFEL has paved the way for all users of the facility who greatly benefit from these pioneering experiments,” emphasises European XFEL managing director Robert Feidenhans&apos;l. “We are very pleased - these results show that the facility works even better than we had expected and is ready to deliver new scientific breakthroughs.” The scientists present their results, including the first new protein structure solved at the European XFEL, in the journal Nature Communications. The 3.4 kilometres long European XFEL is designed to deliver X-ray flashes every 0.000 000 220 seconds (220 nanoseconds). To unravel the three-dimensional structure of a biomolecule, such as an enzyme, the pulses are used to obtain flash X-ray exposures of tiny crystals grown from that biomolecule. Each exposure gives rise to a characteristic diffraction pattern on the detector. If enough such patterns are recorded from all sides of a crystal, the spatial structure of the biomolecule can be calculated. The structure of a biomolecule can reveal much about how it works. However, every crystal can only be X-rayed once since it is vaporised by the intense flash (after it has produced a diffraction pattern). So, to build up the full three-dimensional structure of the biomolecule, a new crystal has to be delivered into the beam in time for the next flash, by spraying it across the path of the laser in a water jet. Nobody has tried to X-ray samples to atomic resolution at this fast rate before. The fastest pulse rate so far of any such X-ray laser has been 120 flashes per second, that is one flash every 0.008 seconds (or 8 000 000 nanoseconds). 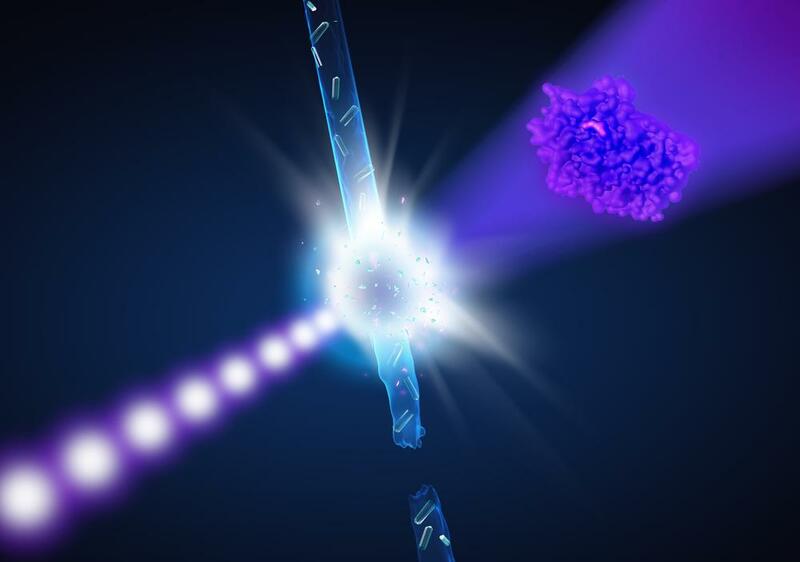 To probe biomolecules at full speed, not only the crystals must be replenished fast enough – the water jet is also vaporised by the X-rays and has to recover in time. “We revved up the speed of the water jet carrying the samples to 100 metres per second, that&apos;s about as fast as the speed record in formula 1,” explains Max Wiedorn, who took care of the sample delivery together with his colleague Dominik Oberthür, both from CFEL. A specially designed nozzle made sure the high-speed jet would be stable and meet the requirements. The scientists first determined the structure of a very well-known sample, the enzyme lysozyme from egg-white, as a touchstone to verify the system worked as expected. Indeed, the structure derived at the European XFEL perfectly matches the known lysozyme structure, showing details as fine as 0.18 nanometres (millionths of a millimetre). “This is an excellent proof of the X-ray laser&apos;s performance,” stresses XFEL pioneer Henry Chapman, a leading scientist at DESY and a professor at the University of Hamburg. “We are very excited about the speed of the analysis: Experiments that used to take hours can now be done in a few minutes, as we have shown. And the set-up that we used can even be further optimised, speeding up data acquisition even more. The European XFEL offers bright prospects for the exploration of the nanocosm.” The striking performance of the X-ray laser is also a particular success of the DESY accelerator division that led the construction of the world&apos;s longest and most advanced superconducting linear accelerator driving the European XFEL. 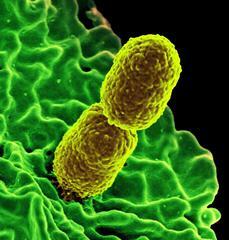 As their second target, the team chose a bacterial enzyme that plays an important role in antibiotics resistance. The molecule designated CTX-M-14 β-lactamase was isolated from the bacterium Klebsiella pneumoniae whose multidrug-resistant strains are a grave concern in hospitals worldwide. 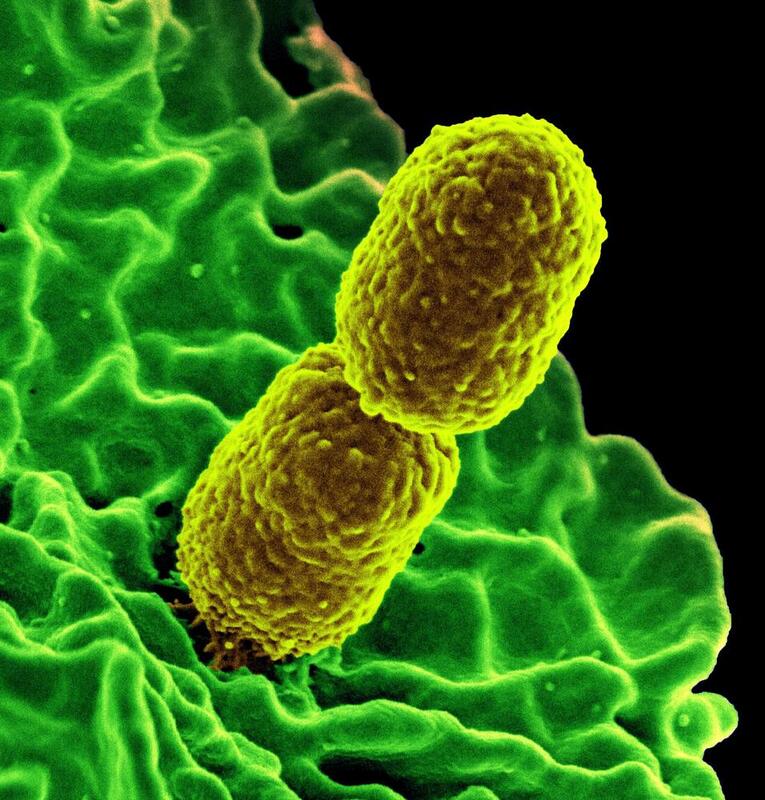 Two years ago, even a &apos;pandrug-resistant&apos; strain of Klebsiella pneumoniae was identified in the U.S. according to the Centers for Disease Control and Prevention (CDC), unaffected by all 26 commonly available antibiotics. The measurements show that it is possible to record high quality structural information, which is the first step towards recording snapshots of the biochemical reaction between enzymes and their substrates at different stages with the European XFEL. Together with the research groups of co-authors Martin Aepfelbacher and Holger Rohde, professors at the University Hospital UKE in Hamburg, the team plans to use the X-ray laser as a film camera to assemble those snapshots into movies of the molecular dynamics of avibactam and this β-lactamase. “Such movies would give us crucial insights into the biochemical process that could one day help us to design better inhibitors, reducing antibiotics resistance,” says Betzel. Serial femtosecond X-ray crystallography (SFX) is a powerful method to determine the atomic structure of a sample, typically a biomolecule like a protein. It builds on classic crystallography, which was developed more than a century ago. In crystallography, X-rays are shone on a crystal. The crystal diffracts the X-rays in a characteristic way, forming a diffraction pattern on the detector. If enough diffraction patterns are recorded from all sides of the crystal, its inner structure can be calculated from the combined patterns, revealing the shape of its building blocks, the molecules. However, most biomolecules are very delicate, easily damaged by X-rays and do not easily form crystals. Often, only very tiny crystals can be grown. The brief, but extremely bright flashes of X-ray lasers like the European XFEL overcome two problems at the same time: They are bright enough to produce usable diffraction patterns even from the smallest crystals, and they are short enough to outrun the radiation damage of the crystals. A typical X-ray laser flash lasts only a few femtoseconds (quadrillionths of a second) and has left the crystal before it is vaporised. This „diffraction before destruction“ method produces high-quality diffraction pattern even from tiny crystals. But as every crystal is vaporised in a single flash, a new crystal has to be X-rayed with every flash. Therefore, the scientists spray thousands of randomly oriented protein crystals into the path of the X-ray laser and record series of diffraction patterns until they have gathered enough data to calculate the protein&apos;s structure with atomic resolution. To collect the data, the detector has to record the fastest X-ray serial images in the world: The European XFEL delivers X-ray flashes in ten so-called pulse trains per second. Within each train, the flashes are separated by as little as 220 nanoseconds. No previously existing X-ray camera could shoot images at this fast rate. The developers of the Adaptive Gain Integrating Pixel Detector (AGIPD) had to use a trick: Different from conventional digital cameras, every pixel of this megapixel X-ray camera is equipped with its own 352 memory cells that can be written at a rate of nearly 5 megahertz (MHz), matching the pulse rate of the X-ray laser. The memory cells cache the image data and are read out ten times a second. This way AGIPD can record 3520 images per second, producing a data stream corresponding to two DVDs per second. Also, every pixel adjusts its sensitivity dynamically to the incoming X-ray light. This ‘adaptive gain’ dramatically widens the sensitivity range of the detector. In the same image there can be pixels with just one photon and those with thousands of photons. This wide dynamic range is not possible with conventional digital cameras. At the European XFEL, one AGIPD is installed and operational, a second one will be installed within the next months. The project is funded by European XFEL, DESY and the Swiss Paul Scherrer Institute, and the developers&apos; consortium included members from Paul Scherrer Institute, University of Hamburg, University of Bonn and DESY. The European XFEL in the Hamburg area is a new international research facility open to research groups from around the world. It is the world&apos;s largest X-ray laser, producing ultrashort and extremely bright flashes of X-ray radiation. The European XFEL is driven by an approximately 2 kilometres long superconducting linear particle accelerator, built by a DESY-led consortium and operated by DESY. It accelerates electrons in tight bunches to almost the speed of light. The electron bunches are then forced through a magnetic slalom course in so-called undulators. In each bend, the particles radiate off X-rays that add up to a laser-like pulse. The European XFEL is designed to generate 27 000 such pulses per second. XFEL stands for X-ray free-electron laser, as the free-flying electrons generate laser-like X-ray flashes. These flashes can be distributed to six measuring stations in the experimental hall, called scientific ‘instruments’, each specialised to different scientific fields like mapping the atomic details of viruses, deciphering the molecular composition of cells, taking three-dimensional “photos” of the nanoworld, “filming” chemical reactions, and studying processes such as those occurring deep inside planets. Two instruments are currently operational, the others will come online in the near future. The operation of the facility is entrusted to European XFEL, a non-profit company that cooperates closely with its main shareholder DESY and other organisations worldwide. At present, 12 countries have signed the European XFEL convention: Denmark, France, Germany, Hungary, Italy, Poland, Russia, Slovakia, Spain, Sweden, Switzerland, and the United Kingdom. The Center for Free-Electron Laser Science CFEL is a cooperation of the University of Hamburg, the Max Planck Society and DESY. DESY is one of the world’s leading particle accelerator centres. Researchers use the large‐scale facilities at DESY to explore the microcosm in all its variety – ranging from the interaction of tiny elementary particles to the behaviour of innovative nanomaterials and the vital processes that take place between biomolecules to the great mysteries of the universe. The accelerators and detectors that DESY develops and builds at its locations in Hamburg and Zeuthen are unique research tools. DESY is a member of the Helmholtz Association, and receives its funding from the German Federal Ministry of Education and Research (BMBF) (90 per cent) and the German federal states of Hamburg and Brandenburg (10 per cent).